John Hardwick, Retired Purchase Manager, life-long resident of South Wingfield and local historian. Michael Parkin, Retired senior police officer and latterly HR Director and employment consultant with an interest in social history. Valerie Herbert, Retired Legal Secretary, interested in the natural world. David Williams, Derbyshire County Councillor and Ripley town councilor, UNITE member and a member of 13 other organisations. Sylvia Mason, Retired lifeguard trainer, swimming teacher, interested in genealogy, researching the family trees of the revolutionaries. Geoff Johnston, Local parish councillor and social worker who has developed an interest in heritage issues. Mark Spencer, Retired Primary headteacher and UNITE member. Roger Tanner, A retired headteacher from Nottingham and keen walker with a long time interest in local labour history. Heather Schofield, Event and entertainment professional with background in theatre marketing and show production. Owned by a border terrier. Patrick Cook, Retired Secondary headteacher with an interest in local history. John Dring, retired senior trade union officer. Achieved the Diploma in Social Studies at Ruskin College Oxford before being employed by the GMB. Author of The Life of Jeremiah Brandreth. John Hopkinson, Retired Head of IT with a local authority and a direct descendent of the 'Pentrich Revolutionary', George Brassington sentenced to Transportation for Life. 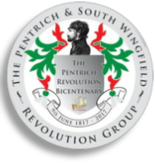 Become a Friend of the South Wingfield and Pentrich Revolution Group or apply for Group Membership. To become a ‘friend’ there is an annual subscription of £5.00, please contact the Secretary, Valerie Herbert initially, as we are in the process of appointing a Membership Secretary. Beki Howey, Management of all aspects of Pentrich 2017 and coordinating the work of other specialists and service providers.